Viewing time: 4 min. 48 sec. The Write Question is a weekly video podcast all about writing. 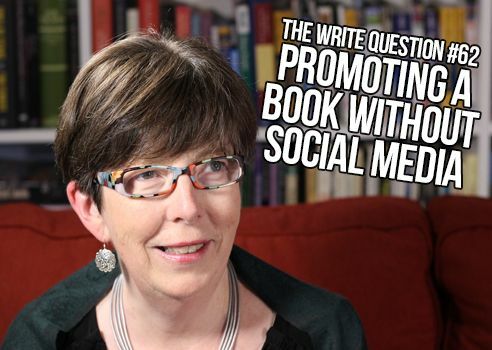 Today’s question focuses on how to promote a book without social media. If you have a question you’d like me to answer, email me at daphne@publicationcoach.com, tweet me @pubcoach, or leave a message for me at the Skype account, The Write Question. Welcome to The Write Question, I’m Daphne Gray-Grant. Today I’m talking about how to promote a book without social media. Today, I have a question from American reader Nancy Larson. Here’s what she’s asked. Thanks for the question, Nancy. You are certainly correct that WRITING a book often ends up being the easiest stage of the entire process. Many people are daunted by the idea of getting 80,000 words down on paper and they fail to realize that the REAL work comes well after the writing job has been completed. In fact, if you had contacted me sooner, I would have suggested getting your website up and running a whole lot earlier because the #1 item that a writer needs is an enthusiastic audience. I’ve had my own website for more than 12 years now and I still see myself as a relative newcomer. If you want to be a book writer — especially an author who doesn’t pursue social media — you’ll need to depend on your website for reaching your audience. Make sure your site includes a blog because that’s how you can share your ideas and promote your own writing. I blog five times per week but you don’t need to start that way. Even once every two weeks might be enough, but if I were you I’d try to blog at a minimum of once a week. And, once you start doing this, be aware that you need to drive readers to your blog. One of the best ways to accomplish this is to guest post on other sites. Don’t expect money for guest posting. But the effort will pay off if you get new readers. When I was starting out I remember guest posting for one particular site and every time my column appeared I would get 200 new subscribers. That was a terrific value for me. Consider providing your readers — or some of your readers — with swag. I sometimes give my readers bookmarks but other ideas are postcards, stickers, book plates, buttons and pens. It will cost you a little bit of money, but not much and it will get your name — and the name of your book — out there in reader land. Another idea to think about is public speaking. Can you meet with a book club or writing group or can you give a speech to a service club such as Rotary or Kiwanis. If you take this route, one of my readers suggests requiring a minimum (wholesale) purchase of books that they can resell to members or give away as door prizes. You’ll have to speak for free of course, but you can make the job more financially attractive by insisting on a purchase of your books, first. And don’t forget about online forums. Sites such as Quara (I’ve provided a link below) give you a place to connect with others interested in your subject matter or in fiction if your book is a novel. Just be sure your answers include links back to your own website — in as natural and non-sales-y a way as possible. You might also want to consider podcasts. Don’t go to the work of starting your own podcast, but see if you can offer yourself as a guest for others. I suggest this because we’re all different and some people really respond to the audio format. You want to reach those potential readers, too. Selling and marking a book is a huge undertaking, Nancy, and it’s one that writers often wrongly assume the publisher will handle for them. Only big-name writers, like Stephen King and Margaret Atwood get significant marketing. Otherwise, the job is left up to the author. Don’t let your distaste for social media put you at a disadvantage. Just resolve to find another way to reach those readers. It’s worth the effort because you will be rewarded with increased sales. Promoting a book is hard, time-consuming work. But it also gives you highly measurable results and there’s a huge reward to that. You may never know whether the book you’ve written is “excellent” but you will always know exactly how many copies you’ve sold.